Uttoxeter Racecourse hosts its biggest race of the season in the form of the Betfred Midlands Grand National this weekend. The long distance handicap steeplechase, run over 4 miles and 1 ½ furlongs, has a long history, having been staged since 1969. This year’s race, which is for horses aged five years old and over, is headed by Well Refreshed and Chac Du Cadran, and will contain the 2012 renewal winner, Master Overseer. Despite Betfred being the title sponsor for the race, we advise you to place your bets on this race on Bet365.com, the best when it comes to horse racing betting, which is where the odds listed below are taken from. Bet365.com is also offering each-way betting on the Midlands Grand National, with which you will be paid out at 1/4 should your selection place in positions one through three. Master Overseer has been placed at 12/1 to regain the title he won last year. With eight career wins, including two in his last three starts, Master Overseer has been there before and is an interesting option. To consider, however, is the fact that no horse has ever won this race more than once, and that no horse aged ten years old or over has won this race since 1995. Master Overseer is now ten years old. The early odds favourite is bay gelding Well Refreshed, who comes into the race with three wins on the trot (and four in his last five), two of which have come this year already. The nine year old’s owner, Patrick Wilmott, will be confident that his horse can deliver him his sixth win from his seventeenth start. Chac Du Cadran, winner of the North Yorkshire Grand National Handicap Chase in January at 11/2, takes his place alongside Well Refreshed at the top of the early odds tables. The seven year old gelding has won two races in the last five years, however. The race also features No Secrets and maybe Monbeg Dude, winner of the Welsh National in February, who was also entered in the Cheltenham Gold Cup Challenge scheduled to take place on Friday. No Secrets has won his two last races, the last of which was in February at Wetherby. Storm Survivor and Carruthers further make up a strong field. Carruthers, the 30 race veteran, came through with the win at 6/1 in the William Hill Wales National Handicap Chase in February and will be looking for his tenth career win on Saturday. The going at Uttoxeter will be Soft. The race takes place on Saturday at 16:50 CET/ 11:30 EST. 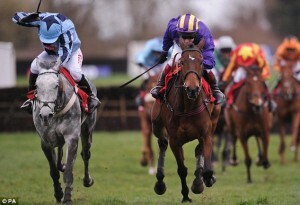 As we stated above, the best place to have a bet on the 2013 Betfred Midlands Grand National is at Bet365.com. When visiting Bet365.com, click ‘Horse Racing’ in the left sidebar and scroll down to the Antepost section of the page, where you will find all the markets for this race. The Midlands Grand National is a listed national hunt race in Britain. It is a handicap steeplechase run over a distance of 4 miles and 1 ½ furlongs and is for horses aged five years and older. Check out the race’s wiki page for further information on the race.